The importance of Customer Lifetime Value (also called CLV, CLTV, LCV, or LTV marketing) has been understated for a long time. CLV is the most important metric that companies ignore. Marketers have been writing about how important knowing CLV is for years, and it’s still being ignored or underutilized: a 2018 UK study found that only 34% of the marketers they surveyed were “completely aware of the term and its connotations.” And only 24% of respondents felt their company was monitoring CLV effectively. There are other methods of calculating CLV that get much deeper and can focus on the individual customer. In this article I’m going to move straight into the importance of Customer Lifetime Value, and the actionable ways you can use it to improve your business. If you’d like more background on the metric or ways to calculate it, I recommend this write-up from the Harvard Business Review. Why is Customer Lifetime Value Important in 2019? Your customer acquisition costs may very well equal more than you make from a first purchase, but are you still making money from that customer in the long run? Figuring out the lifetime value of a customer to your company will give you the answer. 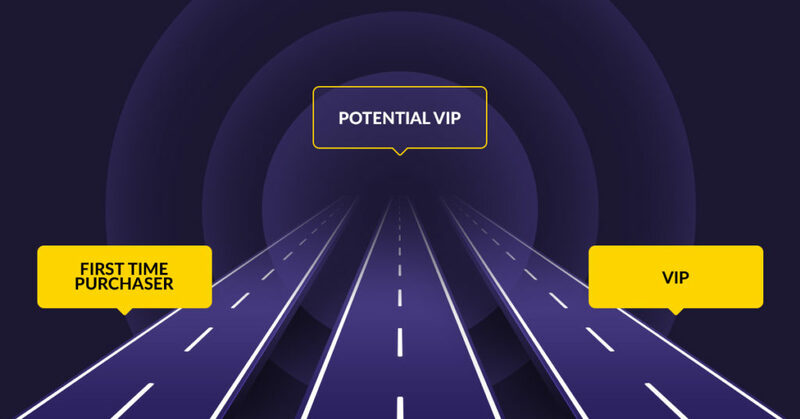 You can narrow your focus: send a special offer or gift to your “VIP” customers to make sure you retain them, or focus on acquiring new customers with similar backgrounds using look-alike modeling. You can start slowly upselling less valuable customers to increase their CLV. This segmentation allows for a personalized experience; something many customers now expect. It’s a competitive market for e-commerce companies in 2019, and price isn’t the only determining factor in a customer’s decisions. CLV is a customer-centric metric, and a powerful base to build upon to retain valuable customers, increase revenue from less valuable customers, and improve the customer experience overall. It’s about Customer Lifetime Value meaning more than any one statistic. Finding your Customer Lifetime Value will make you think, not just about the sale, but about the full customer journey: when, where, why, for how much, and how often do your customers make a purchase. Answering these questions will bring valuable insights, and help you spot issues you may not have noticed before. 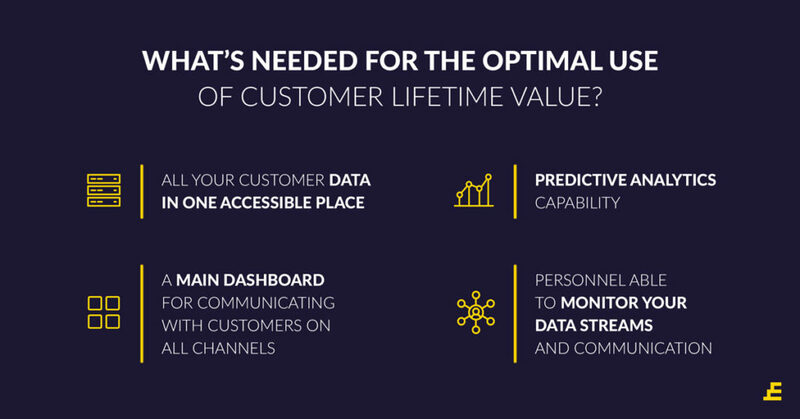 Why Don’t More Companies Use Customer Lifetime Value Effectively? As companies grow, it’s common for their data to become fractured; different pieces kept in separate places (often using different software) as each department pursues its own goals. This makes collaboration more difficult, and can result in less trustworthy data if the same information is stored in two places without an effective time-stamp to show which is more current. The old model for finding ones’ most valuable customers was through RFM analysis: examining the Recency of a customer’s last purchase, the Frequency with which that customer makes a purchase, and the Monetary value of their purchases. RFM analysis is still what’s used by most companies looking into this metric; even with the data separated into silos, an RFM analysis is still possible. But we know a lot more about our customers in 2019. Siloed data also gives reason to why only 24% of respondents in the previously mentioned study believed their company was monitoring CLV effectively: without unified customer profile data, it’s nearly impossible to get the sort of actionable results you want. In order to make use of the wealth of data that’s been collected, you need a CLV model that utilizes Machine Learning methods to make it predictions. And that’s just not possible with siloed data. 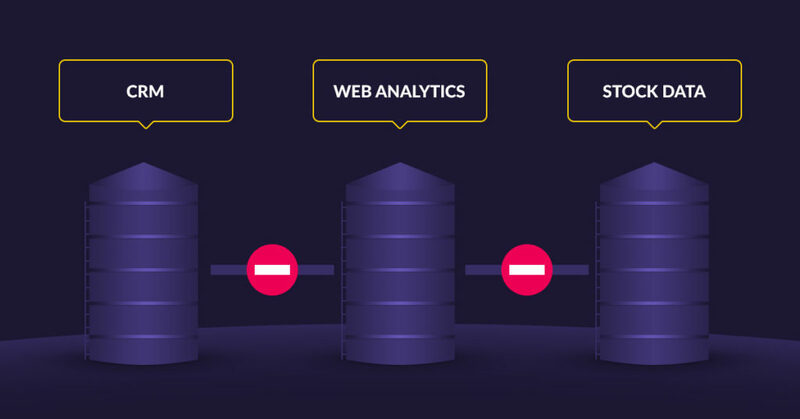 With the same customer making purchases from their computer, phone, and tablet, many companies have difficulty combining all the data streams into one measurable whole. Attempting to extract meaningful insight from these separate streams can be both expensive and inefficient. Companies without a main dashboard synthesizing all customer data in one place are finding themselves increasingly left behind. Many companies who have not yet begun tracking CLV are dealing with a lack of qualified personnel to follow the data and produce actionable plans based on it. This, coupled with the need for an in-house dashboard for that qualified personnel to use, creates a strong barrier to entry. In order to get the most out of CLV, some of the specifics discussed in this article are a must. Once you’ve performed a CLV analysis on all your current customers, you’ll know how much it makes sense to spend on acquisition. You’ll also know which acquisition channels produce the highest value customers, and can repeat the strategies you used to find them. Once you have a solid data profile of what characteristics your VIPs have, you can use predictive analytics to get a strong idea of which new customers will likely be future VIPs, and focus on these customers with personalized messaging and offers You can also make use of a look-alike model, as was mentioned in the first section, to target similar profiles. We touched on this in the first section. CLV makes it possible to identify which customers are VIPs and which are lower value. Once you separate your customers into different value tiers, you can see where your money is really coming from. Look at your VIPs, the 5% on top: how much of your total revenue is provided by just this 5% of your customer base? With defined levels of customer value, you can then focus on converting customers from their current tier to a higher one. Now that you now know the Average Order Value and Purchase Frequency of your customers, the door is open for personalized messaging to send the right offer to the right person at the right time. The insights gained from calculating your CLV will lead you to where problems can be found in your company: you’ll be able to see which area you most need to invest your time and money into. If you know your CLV, you can figure out how much you can spend on acquisition while remaining profitable. This, in turn, allows you to determine how much you’ll need to spend on advertising much more precisely. Without CLV, you’re relying on the profit from the first purchase to tell you which customer is more valuable. Take this Customer Lifetime Value example: Jim spent $6 and Billy spent $15 so Billy is the kind of customer we care about. But after measuring for CLV, you may find that Jim makes multiple purchases a month, while Billy is never seen again. Now you know that the ads you invested in to acquire Jim can actually create more value than the ones that acquired Billy. Scale that with the data of all your customers, and you get the full picture of which ads are most effective for your business. Most major companies realize the importance of Customer Lifetime Value, and are slowly getting better at using it effectively. To save time and money, many of these companies have begun partnering with SAAS companies, whose tech is ready to be implemented. If you’d like to hear how Exponea, as one of these SAAS companies, can help your company, please be sure to contact us. To apply what you’ve just learned, click here.